To protect your family and yourself from the harmful effects of the Ultra Violet rays of the sun and also to save your inside furniture from fading; reduce the effect of incoming sunlight to your home. 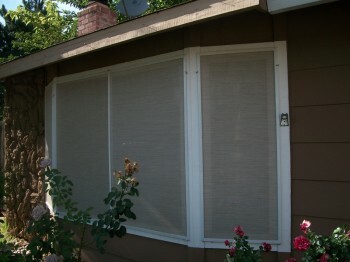 You can do this either by tinting your house windows with films or by selecting sunscreens; both of these are equally effective in reducing the amount of light coming in your house. Lesser sunlight in the rooms means lower temperature and these protective materials are especially useful in warm climates, since your air conditioner do not have to work overtime to keep the temperature down; thus saving your expense on energy consumption. It is difficult to compare between these two, since both are equally effective in restricting the light coming in and keeping the room temperature low; you can choose any one of these as per your convenience and liking. Both, sunscreens and tinted windows reduce the absorption of heat from glass and this is measured as “solar heat gain coefficient”. The tainted windows are advantageous but have some disadvantages, too. These windows reduce the incoming light only when you keep these closed and you can either avail the facility of air circulation or reduced temperature, but not both at the same time. However, if you have installed decorative windows in your house, then tainted windows are going to prove beneficial, since these windows do not open. One more disadvantage of the tainted windows is that the tainted pane can absorb heat and transfer it inside the rooms, thereby unnecessarily increasing the room temperature. You have to see to it that the film is properly applied; otherwise the heat is going to get trapped between panes, thereby stressing these and damaging the warranty of the window. Sunscreens, too, have their own advantages and disadvantages. It is generally believed that the phoenix window sunscreens are more effective, since these allow the heat of the sun rays to circulate before the window panes absorb it and transmit it inside the rooms. Though these offer you lower visibility than the tinted windows; however this feature is not available with tinted windows. As per the Effective Windows Collaborative theory, because of this phenomenon, the solar heat gets reduced considerably, say by around 40% to 70%. By installing the sunscreens, you will have the flexibility of opening and closing your windows for air circulation and during winter you can remove the panes and allow the sunlight to come in for heating up your rooms. Sunscreens are generally made from polyester or fiberglass and hence are economical and since, these are densely weaved; provides you not only comfort but privacy, too. If you have storm doors and windows installed in your ancestral home, you can replace these, too, with sunscreens. To install, remove the screen from the windows and though the removal process varies depending on the style and design of your old window; you should initially determine your requirements and purpose. Always purchase good quality sunscreens from reputed manufacturers and ensure that these prevent both UVA and UVB rays from coming inside your rooms. Log on to the internet to know more about these products from the websites which sell these. Adhere to manufacturer’s instructions for cleaning the sunscreens, since this should be done periodically. Sun rays can gradually discolor the sunscreens and though it is not possible to remove discoloration; you can use sealers to restore their quality. If you are looking for more home energy saving ideas, check out the Green DIY Energy program on the web. I wrote a short GreenDIYEnergy review about the program on this blog, please read it for more information.